Can I choose which unit/tenant to enable for Online Rent Payment? Can I use SimplifyEm.com Property Management Software without Online Rent Payment? Why should I use Online Rent Payment? Why should my tenant setup Online Rent Payment? Does my SimplifyEm.com Property Management Software Online Rent Payment subscription include a place where my tenants can sign in? How do I setup Online Rent Payment for my tenant? What does my tenant need to sign up to pay rent online? Once a tenant's rent payment is withdrawn, will I be notified? How much time does it take to receive rents through SimplifyEm.com Property Management Software? What happens if the rent is not withdrawn in time or when the tenant does not have enough money in their bank account? How much does Online Rent Payment really cost? Are there any hidden fees? How do I know my rental payments will be transferred to the correct account? Can I change the bank account that the rental payments are going in to? If all my tenants pay via Online Rent-Payment, will I never have to record rents again? How do I record a rent payment collected when there are insufficient funds in my tenant's bank account? Why do I see a pending state even after I verify my bank account? What am I doing wrong? Will I be notified when the tenant is setup and ready for Online Rent Payment? 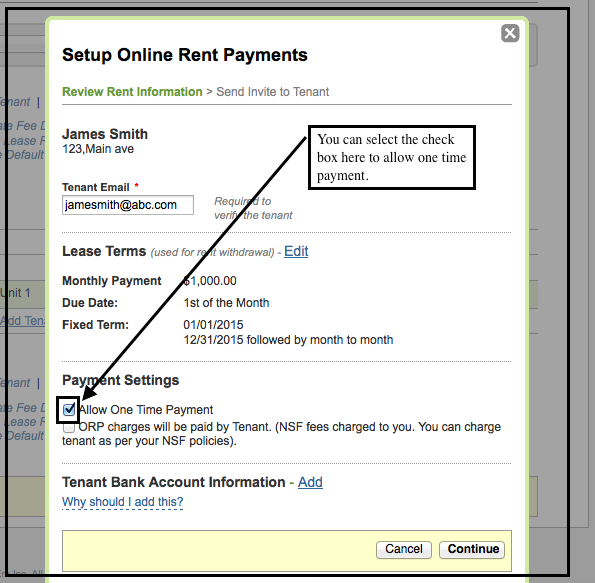 Can I setup rent reminders for my tenant with online rent payment? How does allocation of rent payments work with Online Rent Payment? Why does Online Rent Payment get suspended when I edit the tenant's lease terms? Why do I see Online Rent Payment suspended for a tenant? Why can't I delete my tenant row on the worksheet? What happens if my tenant cancels Online Rent Payment? What happens if I decide to cancel Online Rent Payment for my tenant? Will I lose the recorded rent amounts? How will I know the money transfer discontinued? How can I refund a rent payment? Can I skip/Resume an Auto payment? Can I stop Auto rent payment? Can I make a One time Payment using Simplifyem.com's Online Rent Payment option? Can the tenant pay the Online Rent Payment charges? How can I pay a specific amount only one time? Can tenants pay online rent via Credit Card? 1. Can I choose which unit/tenant to enable for Online Rent Payment? Yes, you can choose specific tenants to enable for Online Rent Payment. Setting up Online Rent Payment is a snap! All you have to do is check your bank balance. Your income and expense worksheet is automatically updated on SimplifyEm.com Property Management Software. See details on "How do I setup Online Rent Payment for my tenant?" 2. Can I use SimplifyEm.com Property Management Software without Online Rent Payment? Yes. You can use SimplifyEm.com Property Management Software without subscribing to Online Rent Payment and collect your own rents manually. See Data Entry on Worksheet for details. 3. Why should I use Online Rent Payment? Direct integration with SimplifyEm.com Property Management Software Property Management software makes entire rent collection process seamless with no data entry! 4. Why should my tenant setup Online Rent Payment? 5. Does my SimplifyEm.com Property Management Software Online Rent Payment subscription include a place where my tenants can sign in? Yes, all SimplifyEm.com Property Management Software users who have Online Rent Payment enabled include a separate site for your tenants to sign in to setup up and view web-based communications. Tenants can view copies of rent reminders. 6. How do I setup Online Rent Payment for my tenant? It's as easy as 1-2-3 ! 1. Setup lease for your tenant. See "Where do I enter Lease for my tenants?" for details. 2. On the Tenants & Leases page, setup Online Rent Payment for tenants you want to collect rent online for. 3. You will see the Step 1 of "Setup Online Rent Payment" window to Review Tenant Information . Verify your tenant and lease information. Make sure the lease terms you setup are correct. You can also setup the tenant's bank account information for quick tenant set up if you have the tenant's previous rent check available. If we have not setup your bank information for depositing rents, we'll ask you the first time you setup a tenant for Online Rent Payment. SimplifyEm.com Property Management Software will verify your bank accounts for deposits. Remember, your invites will not be sent to tenants till you have verified you bank information. See "How do I know my rental payments will be transferred to the correct account?" for details. 5. Once you have verified your bank account information, SimplifyEm.com Property Management Software will automatically sent invites to your tenants to set up. With a quick set up and account verification by the tenant, SimplifyEm.com Property Management Software is ready to automatically process your rents! 7. What does my tenant need to sign up to pay rent online? Once you have verified your bank account, SimplifyEm.com Property Management Software will automatically send email invites to your tenants. After the tenant receives the invite, all they need to do is to follow the instructions in the email to verify their identity, create an account and set up! 8. Once a tenant's rent payment is withdrawn, will I be notified? Yes. SimplifyEm.com Property Management Software updates the landlord's worksheet on same day the payment is received. This will reflect on the monthly cash flow report you receive for your properties. SimplifyEm.com Property Management Software also immediately updates the tenant accounts to show when the payments were submitted and the status of those payments. 9. How much time does it take to receive rents through SimplifyEm.com Property Management Software? SimplifyEm.com Property Management Software verifies your tenants' payments within three business days and then immediately submits them to your account for deposit. The time it takes from when SimplifyEm.com Property Management Software submits the deposit to your bank to when the deposit clears your account may vary depending upon your bank. When SimplifyEm.com Property Management Software collects your tenant's rent payment online, your account will immediately be updated every step of the way, informing you of when payments were received. Your worksheet will get updated with the rent payments received and allocated against the rent due date for you. 10. What happens if the rent is not withdrawn in time or when the tenant does not have enough money in their bank account? If SimplifyEm.com Property Management Software does not receive a rent payment on time, we will notify you that the payment was not received on time and we will automatically send the tenant a late payment reminder. SimplifyEm.com Property Management Software will not accept any partial online rent payment from your tenant. SimplifyEm.com Property Management Software will update the worksheet and reports with the "rent overdue" status and will continue to schedule the online rent collection for the next rent due date. If rent has not been collected via Online Rent Payment due to NSF (Non-sufficient funds), the landlord is required to collect the rent payment manually from the tenant and ensure that there are sufficient funds available in the tenant's bank account. See details on "How do I record a rent payment collected when there are insufficient funds in my tenant's bank account?" Remember, in the event that a tenant has insufficient funds, there is a service fee of $25.00 per incident. 11. How much does Online Rent Payment really cost? Are there any hidden fees? You can setup Online Rent-Payment for your tenants for a fee as low as $1/month/tenant. There are no setup fees and no cancellation fees. There are no additional fees involved unless a rent transaction is returned due to insufficient funds or error in bank data. In the event that a tenant has insufficient funds in their bank account, there is a service fee of $25 per incident. See "How much does SimplifyEm.com Property Management Software cost?" for more details. 12. How do I know my rental payments will be transferred to the correct account? SimplifyEm.com Property Management Software verifies your bank account by making two small deposits into your account when you set it up. We'll verify your identity by asking you to confirm the deposit amounts. By confirming the deposit amounts correctly, you'll confirm that SimplifyEm.com Property Management Software has the correct account number for you. 13. Can I change the bank account that the rental payments are going in to? Yes. You can change the bank account that your payments are going to, but remember, doing so will suspend online rent payments for all your tenants until you verify your bank account. 2. Click on "Change Bank Account" link on the Online Rent Payment widget on the right side of the page. 3. You will see "Setup your Information" window where you can change your bank information. Remember to accept the terms and conditions to add the new bank information. 14. If all my tenants pay via Online Rent-Payment, will I never have to record rents again? That's correct! SimplifyEm.com Property Management Software collects all your rent payments online and automatically records them on your Worksheet, Income & Expense Report, Rent Roll Report and Tenant Payment History Report. When there are insufficient funds in your tenant's bank account, you will be required to collect the overdue rent payment and record it manually on the worksheet. 15. How do I record a rent payment collected when there are insufficient funds in my tenant's bank account? Remember, SimplifyEm.com Property Management Software will continue to collect rent automatically for the next rent due date. 1. Go to the property on the worksheet which has the tenant row. 16. Why do I see a pending state even after I verify my bank account? What am I doing wrong? 1. You may not have setup your payment information . Invite to your tenants won't be sent out till you setup your payment information. 2. Your tenant has not finished setting up for Online Rent Payment. Once the invite has been sent to the tenant, the tenant needs to create an account, setup and verify their bank account to activate online rent payment. 17. Will I be notified when the tenant is setup and ready for Online Rent Payment? Yes. Once the tenant is set up and verified their bank account information, SimplifyEm.com Property Management Software will notify both the landlord and the tenant that Online Rent Payment is ACTIVE , and when the first online rent payment be done. Your account will also be updated with the ACTIVE state for the tenant who is set up. 18. Can I setup rent reminders for my tenant with online rent payment? 1. Go to the Tenants and Leases page and select the property in which the tenant rents. 2. Select the tenant row that you want to setup rent reminders for. There will be ACTIVE for this tenant row. 3. Go to the take action menu and click on "Automate Rent Reminders"
See details go to "How can I automate rent reminders for my tenants?" 19. How does allocation of rent payments work with Online Rent Payment? When SimplifyEm.com Property Management Software collects your tenant's rent payment online, your worksheet gets updated with the rent payments received and will get auto-allocated against the rent due date for you. You can then enter notes or attachments for the rent transaction collected online by SimplifyEm.com Property Management Software. Remember, you cannot edit the rent transaction amount that is collected online. 20. 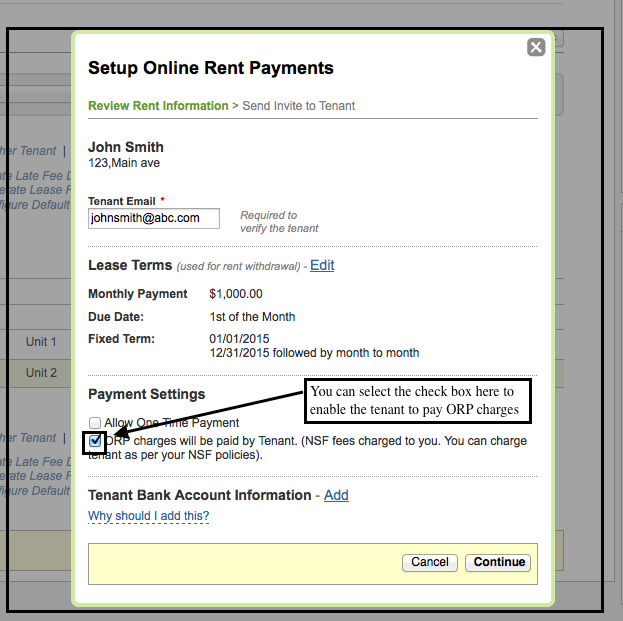 Why does Online Rent Payment get suspended when I edit the tenant's lease terms? Every time you edit the lease terms for a tenant who is setup for online rent payment, SimplifyEm.com Property Management Software will suspend all online rent payments until the tenant has verified the new lease terms. SimplifyEm.com Property Management Software will notify you and the tenant of the suspended state. 21. Why do I see Online Rent Payment suspended for a tenant? 1. Your tenant changed their bank account. The tenant will need to verify their bank account to enable online rent payments. SimplifyEm.com Property Management Software will notify you once the tenant has verified their bank account and when SimplifyEm.com Property Management Software is ready to automatically process your rents! 2. Lease Terms expired for the tenant in SimplifyEm.com Property Management Software. You will need to either renew your lease terms or mark the tenant as moved out. Every time Online Rent Payment gets suspended, SimplifyEm.com Property Management Software will notify you and the tenant of the suspended state. 22. Why can't I delete my tenant row on the worksheet ? If you have any tenant enabled for Online Rent Payment, SimplifyEm.com Property Management Software will not allow you to delete the tenant. You will need to cancel online rent payments for your tenant. 23. What happens if my tenant cancels Online Rent Payment? When your tenant cancels Online Rent Payment, SimplifyEm.com Property Management Software notifies both the landlord and the tenant that online rent payments have been cancelled. The tenant has read-only access to their account. To enable it again, you will have to setup Online Rent Payment again for the same tenant. See detail on "How do I setup Online Rent Payment for my tenant?" 24. What happens if I decide to cancel Online Rent Payment for my tenant? Will I lose the recorded rent amounts? How will I know the money transfer discontinued? If you cancel online rent payment for a tenant, SimplifyEm.com Property Management Software will keep all the rent transactions that were recorded via online collection. You will not lose them. SimplifyEm.com Property Management Software will also notify both the landlord and the tenant that online rent payments have been cancelled and the tenant will have read-only access to their account. 25. How Can I refund a rent payment? SimplifyEm.com Property Management Software does not support refund of rent payments collected online. You will have to write a manual check for your tenant to make refunds. 26.Can I skip an Auto Rent Payment? Yes, you can skip an Auto Rent Payment by signing into your Tenant Portal account and then click on the "Skip Next Auto Rent Payment" link.This will skip the Auto Rent Payment and set it to next due date. So in our example: If we click on "Click Next Auto Rent Payment" then the Next Scheduled Withdrawal date will be set to 05/01/2015. 27.Can I Stop/Resume Auto rent payment? Yes, you can stop "Auto Rent Payment". You will have to SignIn to the Tenant Portal and go to "Account Settings" link. In the Account Settings page you can click on the link "Stop Auto Rent Payment". This will stop Auto Rent Payment. To Resume Auto Rent Payment, SignIn to your Tenant Portal account and just click on the link "Resume Auto Rent Payment". Now your Auto Rent Payment is active again and the Next Scheduled Withdrawal Date will be set to the next rent due date. 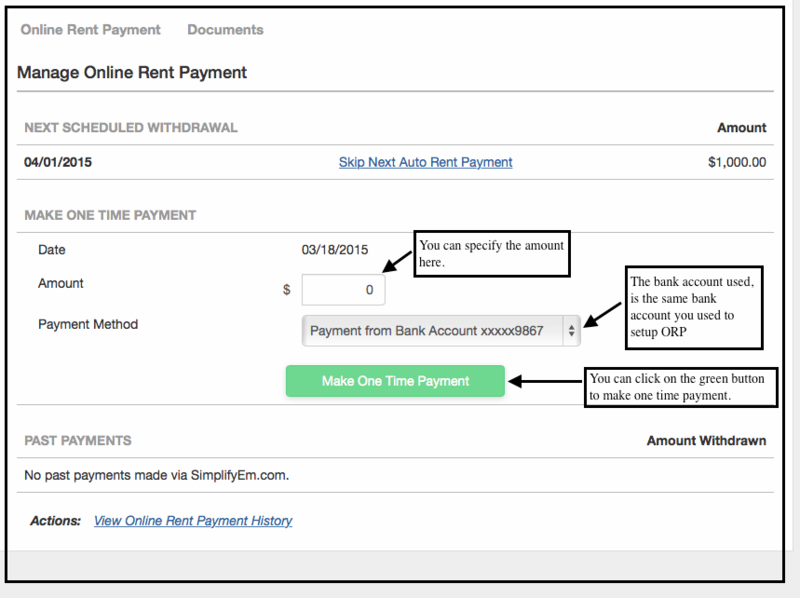 28.Can I make a One Time Payment using Simplifyem.com's Online Rent Payment? Yes, you can make a one time payment using simplifyem.com's Online Rent Payment. The tenant can SignIn into their Tenant Portal and make a one time payment. See details on how to setup portal here: " How do I setup a place for Tenants/Owners/Vendors to login to see their information?" Here's how One Time Payment works. 1. The Landlord or Property Manager will have to enable One Time Payments for the tenant.He can do this while inviting the tenant for Online Rent Payment(new ORP activation) or for already ORP active tenants he can go the Tenant Center and enable one time payments from the "Take Actions" menu. When the Landlord or Property Manager clicks on the Automate button on the Tenant Center page, he can check the box next to the One Time Payment to enable the tenant for One Time Payment. The landlord or Property Manager, from the Tenant Center page will click on "Take Action" drop down and then click on "Configure Payment Settings" link. A new pop up window will open and you can select the check box next to One Time Payments. 29. Can the tenant pay the Online Rent Payment charges? Yes, the tenant can pay the ORP charges.The Landlord or Property Manager can enable the tenant to pay the ORP charges. When the Landlord or Property Manager clicks on the Automate button on the Tenant Center page, he can check the box next to ORP charges will be paid by the tenant and enable the tenants to pay the ORP charges. The landlord or Property Manager, from Tenant Center page will click on "Take Action" drop down and then click on "Configure Payment Settings" link. A new pop up window will open and you can select the check box next to ORP charges will be paid by Tenant. 30.How can I pay a specific amount only one time? You can pay a specific amount through our One Time Payment.For this you will have your Online Rent payment setup and also the Landlord or Property Manager should have you enabled for One Time Payment. See links:Can the tenant pay the Online Rent Payment charges? You can SignIn to your Tenant Portal Account through our home page www.Simplifyem.com.Once you have logged in you will land on our Manage Online Rent Payment page. Here you will be able to specify the amount you want to pay and make a One Time Payment for the specific amount. 31.Can tenants pay online rent via Credit Card? Yes, tenants can make a one time rent payment using their credit card. To do a credit card payment the tenant must have their Online Rent Payment setup and active. To setup online rent payments for tenants refer this "How do I setup Online Rent Payment for my tenant?" From the One time Payment section enter the payment amount and from the payment method drop down select Credit Card. 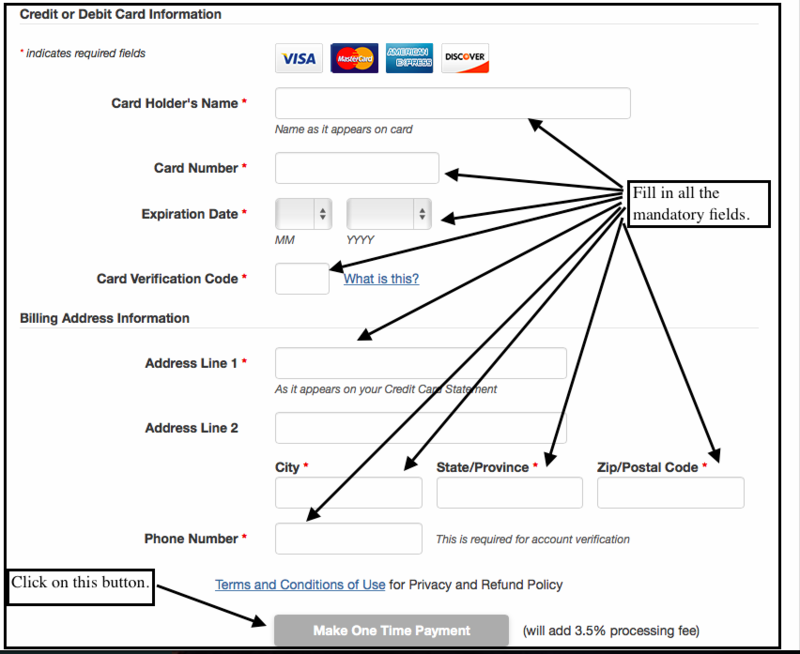 Now once you select credit Card a new section will open up asking for your card information.Please fill in all the mandatory fields and then click on Make a One Time Payment button.